at the beach, in the city, hidden in towns we’ve never heard of. from small-town stillness and mortal time? real ones for shelter and metaphors to stretch out in as we run. Art is never created in a vacuum. Artists are part of their communities. What they create can bring people together, but also challenge those around them to think in new ways. There are a million ways grassroots activists can use art to call attention to issues that affect the immediate and larger environment. Sometimes, that art is provocative, sometimes playful, sometimes profoundly moving. Purpose: Showcase events that highlight a particular theme can bring artists together from a range of disciplines. This type of event is a great way to build community among the artists themselves and between their varied audiences. Theme: The theme can be anything the organizers believe needs to be addressed (climate change, immigration rights, LGBTQ rights, women’s issues, diversity, freedom of speech, etc.). Call for Work: Artists can be invited to create pieces specific to the theme. Robust Line-up: Having a full line-up of artists (writes, dancers, musicians, actors, visual artists) helps bring in a larger audience. Open Mic: Hosting an open mic as part of the evening lets others feel that they have a voice and can participate. Fundraising: Such events can also function as fundraisers for good causes. Awards: Organizers can also award prizes for the best works created or honor a local artist who had contributed to the community. Giving prizes to different age categories (child, teen, adult) can bring in lots of audience members. Audience Participation: Events can be used to involve the audience in creating art works about the focus issue or messages to leaders you want to influence. Audience members might create a group mural or poem. Or you can provide pre-addressed postcards for audience members to write messages to leaders. Logistics: Have a large group of volunteers break up tasks such as providing food and drinks, setting up the venue, promoting the event, handling media, coordinating with the artists, and acting as MC. Signage: Colorful signage with clear bold lettering and a consistent graphic look and feel can help give your events identity and legitimacy. Keep the signs generic enough to be used over and over. Nice banners and posters of various sizes can be printed inexpensively through stores like Staples or Office Depot. Promotion: Make sure to use social media to promote your event as well as posting fliers and sending out blast emails. Post and share teasers that highlight the work of participating artists. Send press releases to local papers. Have all participating artists and organizations share through their networks. Collaboration: Collaborating with establish organizations to plan and host your event will greatly increase your reach. Consider partnering with local arts nonprofits and councils, women’s groups, immigrant groups, etc. Tap into their PR and volunteer networks. Documentation: Find a volunteer who can take photos and video at the event and is willing to share them freely for some publicity. Post and share these images after the event to build momentum and community. Write articles for local papers describing the event and its outcomes, especially if you are trying to raise awareness of a particular issue. Examples: Poetry reading that features diverse voices from many ethnic backgrounds. Youth event that focuses on how we can save our environment. An events that asks artists from different disciplines to respond to each other with new art works on particular topics. Purpose: Art installations can be placed in public or private spaces to start discussion and be the focal point for performances or protests. Process: Work with local groups to plan the creation of an installation. You can place a call for artwork and build a committee to assemble the work and promote it. Spaces: Ask local governments for permission to assemble an installation for the public or work with businesses that have the space and desire to be hosts. Involvement: Make the installation interactive, with a way to leave comments or add to the artwork (within certain guidelines). Promote: Hold an event to unveil the installation with music, readings, etc. Examples: “Build a Bridge, Not a Wall” project that asks participants to create artworks on cardboard “bricks” that will be assembled into bridge at various locations and for different events. The “PostSecret” project asks people to write down something they have never told anyone and send that secret on a postcard to the organizers. The postcards are anonymous and can be displayed for the public to read and to spark discussion. What Is It? Participants pop up and perform in a public space with no advance warning. They may be friends or strangers. They disperse just as quickly. Purpose: These can be used to create attention for a specific cause or make a strong statement. Includes: Performances can entail almost anything—music, dance, poetry, or just standing still or lying down. How: Send dates and times through social media to participants willing to show up and perform at public places. The more participants, the stronger the message. The “performance” should seem spontaneous and sudden, as if coming out of nowhere. These can involve lots of prep time to rehearse a coordinated piece or no prep time at all. Promotion: Media can be tipped off if you want the performance covered. Examples: Musicians perform “Here Comes the Sun” at an unemployment office in Spain. An unsuspecting woman places a plastic bottle in a recycling bin and is applauded by 2,000 bystanders to highlight the problem of plastic waste in Quebec. Concerned citizens sing a song about justice in a walking mall in Winchester, VA.
Purpose: To remind community members of an issue, problem, or solution or of the healing power of art in everyday life. How: Work with local business and arts organizations to provide works of art in shops, businesses, community centers, government buildings, and schools. Event: Hold an event to launch the project with a walking tour of sites with art. Include a reading of poems or stories to go with the chosen topic. Awards: Hold a contest for community members of all ages to submit art works to be put on display. Ask for art on a specific topic or celebrating something about the local area. Examples: Poetry books in motels. Framed poems in shop bathrooms. Paintings in laundromats. Brightly painted pianos in outside spots all over a downtown area. My Short Story “The Ocean at Night” Has Been Published in Beach Anthology! 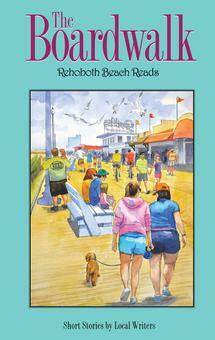 My second published short story is out now as part of the anthology Rehoboth Beach Reads: The Boardwalk. A fortune-telling machine with a mind of its own, professional killers hanging out by the hotel pool, granny run amok in Funland…what’s happened to Rehoboth? Some very talented writers have created a book of great beach reads, that’s what. If you liked The Beach House, you’re going to loveThe Boardwalk. 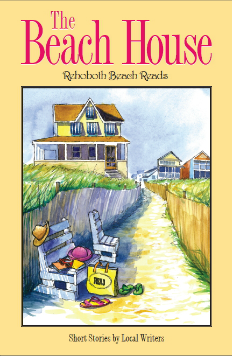 Short stories set in and around Rehoboth Beach, guaranteed to entertain. Check out Cat and Mouse Press for more information. These are fun collections. My First Short Story to be Published! This summer, while on vacation at Rehoboth Beach, I noticed a flyer in Browse About Books, one of our favorite spots, for a short story contest. The winners would be published in an anthology called Rehoboth Beach Reads. This was clearly a way to lure us back to the beach for a book launch. I needed to be in this book! The theme for the anthology was “The Beach House.” Since I’ve been in young adult fiction-writing mode, a story came to me in the voice of a teenaged boy at the beach who loves ghost hunting and also is in need of a friend. He’s saved his money to book a spot in a big late-night ghost hunt in Lewes, Delaware but that’s not where he finally meets his otherworldly match. I worked on the story for a few weeks, getting to know this sweet and goofy kid, then sent it in. Lo and behold, the editors accepted “The Ghost of Henlopen Avenue” for the anthology. The book will be out in late 2013 from Cat and Mouse Press. Check the website here to order copies. Should be a fun collection! onto anyone foolish enough to refuse it. like wings behind his back. Author Melinda Lo has done some great stat crunching to analyze the number of diverse main characters and supporting characters in recent best selling YA. Not many bright spots here although there seems to be an increasing number of supporting characters that qualify as “diverse” in her definition, which includes characters of color, LGBT, and characters with disabilities. Can’t help thinking that if the industry stopped white washing covers and was willing to really promote more diverse YA lit, those books would surface and would sell.